Special order, please allow 2-3 weeks. Here they are, the same custom DDMWorks Wiseco pistons we have been using in of our high horsepower engine builds, now available separately for those that want to build their own engine. The Wiseco detailed skirt shapes and profiles for these pistons are very specific to this application. Variable cam programming software developed in house by Wiseco allows the production of high-performance shapes unique to only Wiseco. The skirt shape (barrel/cam) is one of the most functional areas on the piston, and the custom shape we use provides stability and smooth operation in the cylinder bore. Stability is important for proper ring seal, reduced friction, and quiet operation. The skirt shape is designed for specific running clearance, based on coefficient of thermal expansion of the piston alloy. Some forging alloys expand more than casting alloys, but each Wiseco piston is designed with the proper installed clearance to produce the most power, least wear, and best seal at running temperature, for the Slingshot. Comparing installed clearances on cast vs forged parts is not indicative of the running clearance at temperature. Wiseco engineers have a strong background in all forms of racing applications, and produce the best shapes and designs in the industry. Bore size notes - Stock bores can wear slightly over time which can result in too much piston to cylinder wall clearance. At our shop we prefer to use .5mm larger pistons which require a slight overbore on the sleeves but bore the cylinders to match the pistons exactly and keep the piston to wall clearance in the specified range. 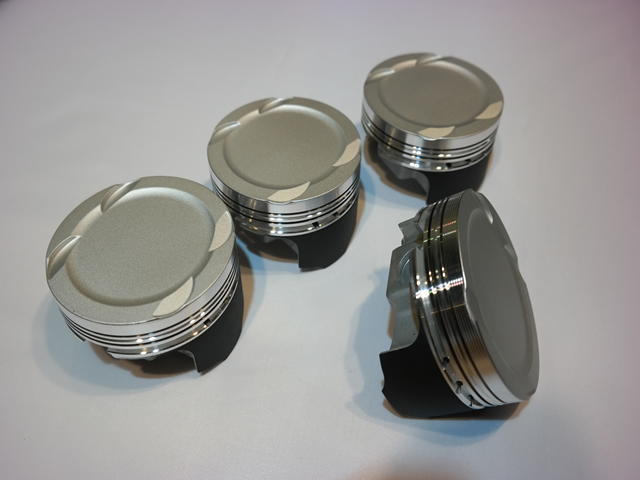 These pistons are 88.5mm which is .5mm larger than stock, custom piston diameters are available, contact us for details if you would like a custom diameter. These are not a direct OEM replacement and should only be installed by a professional engine builder. Compression ratio notes - Although almost any compression ratio can be made on these custom pistons through custom order, these pistons come with a compression ratio of 9.5:1 that we run on most boosted setups we build. This is slightly lower than the standard 10.4:1 found in a stock engine. When installing these pistons, care must be taken to ensure proper oil squirter to piston clearance.